Wieslaw Zenon (Steppy) Stepniewski, 89, of Springfield, Pennsylvania, died December 9, 1998 at Springfield Hospital. During his lifetime he successfully pursued careers as an aeronautical engineer and rotorywing aerodynamicist and university professor. Born in Kamieniec Podolski, Poland, Stepniewski was a 1934 graduate of the Technical University of Aviation Engineering of Warsaw where he earned his master's degree. He left Poland during World War II, travelling to Romania, France and England before settling in Canada in 1941. There he served as a department head at De Havilland of Canada, where he modified the DH-98 mosquito-bomber fighter and designed the DH-1 Chipmunk, a training aircraft which later won many aerobatics championships. In 1947, He joined the Piasecki Helicopter Company in Morton, Pennsylvania and promptly became a member of AHS. At Piasecki, he participated in the design of the SHJP-1, HUP-2, H-16, H-21 Vertol(later Vertol Boeing) 107 Sea Knight and the CH-47 Chinook helicopters. As director of advance research at the Boeing-Vertol Company, he designed the Vertol-76 (VZ-2), a tiltwing aircraft which was the first such design to achieve full conversion from vertical to foreward flight. During his career he published over 50 technical papers and authored a text book, "Helicopter Aerodynamics," which became classic in its field. He retired from Boeing-Vertol in 1975, but remained active as a consultant and as a visiting professor at Princeton University. Stepniewski was an Honorary Fellow of AHS International as well as the Polish Helicopter Society and the I.B. Laskowitz Gold Medal Award of the New York Academy of Sciences. 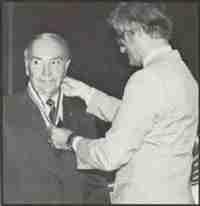 Stepniewski was awarded the first AHS Alexander A. Nikolsky Honorary Lectureship in 1981 and his Nikolsky lecture was "Factors Shaping Conceptual Design of Rotary Wing Aircraft."